The Greek word for hypocrite means pretender, a duplicitous or insincere person. Jesus is calling out the Pharisees for telling others to live in obedience to the Scriptures, but their actions concerning the very same Scriptures they are telling others to obey and live by, tell a very different story, which Jesus knows and sees. I must state upfront that I realize that the church is made up of a lot of people who live in contradiction to what the Scripture teaches. Some reading this may think it’s directed to them, but how would I know that? If the words here make you feel uncomfortable, it’s probably the conviction of the Holy Spirit that is addressing this very thing in your life. 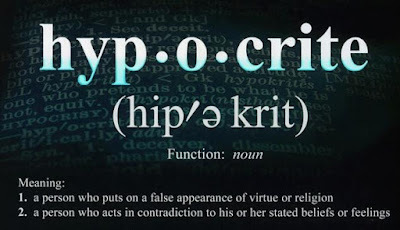 Can there be hypocrites in the church? Yes. Should there be? No, not at all, but it’s only the Gospel and genuine repentance and faith alone in Christ alone that can change a person’s heart and life, to live as a genuine believer who is willing to be an example of Christ through their actions and their witness of the Gospel to others. It is my hope that many in the church who are guilty of this would ask for the help of the Holy Spirit to see if any of this is true in their life right now and if it is, they need to repent of their sins and ask God for His forgiveness because the consequence from Scripture, for remaining a pretender has consequences now and for eternity. So what are the charges of Jesus to these people who pretend to love God and obey His Word? Who are those who think they are better than others, who aren’t worthy of God’s favor and blessing on their lives more than them? 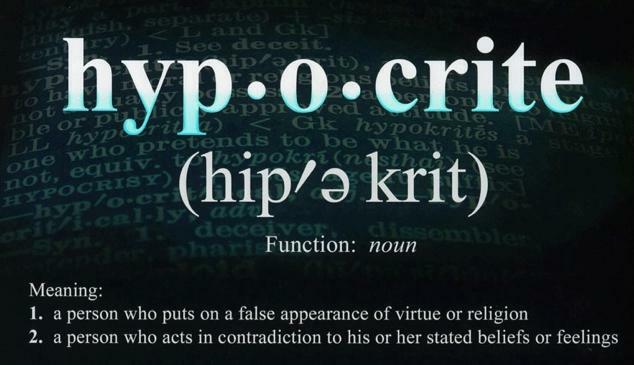 What does someone who pretends to act like a Christian do that makes them a hypocrite? 1). Hypocritical Christians close the door of opportunity for people to hear the Gospel, by preferring certain people in their faith family over others. That is nothing but discrimination and has no place in the Body of Christ and the Bible is clear to prove that in heaven there are people now worshipping the Lord in heaven who are from every country around the world, who speak a different language that what we speak and they are of a different racial background than ourselves. In heaven, there is no discrimination based on geography, ethnicity, racial, or economic backgrounds. The same should also be true within the local church, but when discrimination occurs by a few people that affects the whole body, and such discrimination should never be part of the church ever. Imagine if you will, when Hurricane Harvey hit Houston and Southeast Texas, or Hurricane Irma in Florida last summer, and you received a phone call asking if you could take a stranger, or strangers into your home because neighbors around your couldn't because their homes were either flooded or damaged. What would you do? If you were to say, "I don't know," you'd have to take a good look in the mirror and see if you're a Christian as you may profess to others. You would definitely need to humble yourself before the Lord and ask Him, what you should do, when asked to take in strangers to your home who had been evacuated from their home because it was flooded. But do we really need the Holy Spirit to tell us what to do when it is given to us plainly in Scripture, in Matthew 25:35-36, which says, "I was a stranger and you welcomed me. I was naked and you clothed me." I believe that this isn’t exclusive just to Christians personally, but that the church should do so from its doors too and there were many churches who were able to do this too. People in the community expect it to happen because it is what the church is to demonstrate to others of the genuineness of our faith in Jesus Christ. We know that there can be no mistake in whom we serve sacrificially by providing shelter for people, by providing clothes for them, feed them who are hungry, or giving a drink to those who are thirsty too, Jesus says we are doing it unto Him and him alone. But if people are more concerned about liability issues because of “certain people” possibly ruining the church facility, they have forgotten what it means to serve and to whom they are serving. By refusing to help others, the liability exists in the form of guilt before the Lord for not having shown compassion toward those in need, by shutting the doors to the kingdom, to those whom need to find refuge in it. 2). Hypocritical Christians selectively choose whom they will witness the Gospel. Jesus wants to see all people saved, not those whom a person prefers to see become a Christian. Christians are called to be obedience to both the Great Commandment and the Great Commission. It's not optional. It's a command from the King of Kings and Lord of lords and any personal preference toward people, choosing to witness to certain people over others is wrong, which is neither Christ-centered, nor Gospel-centered. It only displayed a self-centered nature. 3). Hypocritical Christians believe their giving and affirmations to God possess meaning, yet they forget the holiness of God in their giving and worship. Certain people have the ability to plan their giving in larger sums of money due to retirement and this sometimes creates an attitude that if they are not treated right, or listened to, then they'll stop their giving to the church. This type of behavior demonstrates that their giving is not in worship to the Lord, nor is it holy being given to Him, but instead it is being used as leverage to get the pastor to give in to certain pressures made by one or more people. The pastor must never compromise his integrity as a servant of the Lord, as the pastor, and the person, or people within the church should not use their financial gifts to the Lord as a bargaining chip to get their way. Unfortunately, those Christians who are acting like hypocrites with their giving, God sees right through their deceptive actions and words. Such selfishness and deceptive motivations are an affront to God whom these hypocrites have forgotten that God knows the reason for EVERYTHING that they are doing. EVERYTHING. Those who deceive others by their actions and words will lead others to also be deceptive in their actions and words too and the church should have no tolerance for such selfish and sinful behavior. May God open the eyes of the spiritually blind right now too. 4). Hypocritical Christians are proud of their financial support to the church, but they neglect helping other people. God is more pleased with people when they act justly, demonstrate mercy and live in faithfulness to His Word. Financial resources are greatly needed when it comes to helping others and others includes those not within the local church body. I am fortunate to have experienced how pastors from churches whom I have never had any ministry partnership with have come into my family's life and were generous beyond belief in helping my family at various times. It has truly been miraculous, but it has been even more of a testimony that we are all supposed to help each other, to the best of our ability, which cannot be hindered by personal preferences to who that person is, or what part of the city they are from. Jesus points out that he sees that a person gives, but their hypocrisy is observed more for what they didn't do, or won't do, which is to act justly, demonstrate mercy and live in faithfulness to God's Word. Hypocrisy is evident to the Lord when a person chooses only to help themselves, or only certain people because it's convenient, and not help others where it would be most inconvenient. Jesus never discriminated anyone from His grace, mercy and forgiveness and the church should not discriminate anyone either - from either ministering to them, or welcoming them into the faith family. 5). Hypocritical Christians reveal the outward appearance of their lives that does not reflect the inward change by the Gospel. Hypocrites know how to clean themselves up, put on nice clothes, put on makeup (women), look and sound good, but underneath all that Mary Kay or Avon cosmetics on their face, their pleasant speech that sounds nice to others, there's nothing but a stained life underneath it all. They are full of wanting things done their way, or like the way it was done in the past because that is what they are comfortable with, but we're not called to be comfortable. We're supposed to demonstrate obedience to God's Word, not preferences to what someone would rather do because it would be easier, or less risky. Repentance before God is greatly needed and a regeneration of the Holy Spirit within must occur, to those who are simply displaying Christian virtues, but are not living by them. If there's no repentance, there's no change and brings much more into question concerning their lives. 6). Hypocritical Christians have an appearance of Jesus' life within but they are really dead. There's nothing else to their lives, no deep rooted life of the Gospel living through them. The inward life of the person who demonstrates hypocrisy as a Christian is fake and acts contrary to the Word of God, and when a person acts contrary to the Word of God, it is a demonstration of sinful behavior. Jesus says they are full of hypocrisy and lawless. They are pretenders of the faith and they are willingly disobedient to the Word of God. Even more troubling is how Jesus describes such a person as having an outward appearance of beauty, but they are inwardly dead and unclean. It’s just not worth it to pretend to live in obedience to both the Great Commandment and the Great Commission. It’s just not worth it to pretend to look like a devoted follower of Jesus and Jesus seeing nothing but dead bones and uncleanness in their lives. 7). Hypocritical Christians are unwilling to follow the leadership that God has sent to change their attitude and behavior. They prefer to hear what they want and do what they want, rather than obeying what God's Word says to do. They become guilty of being a hearer only and not doing what the Word of God says. Jesus says that whom God has sent to the church in ministry leadership will suffer being killed by the church, public humiliation by lies being told about them and some will even cause them to be chased away from opportunities at other churches elsewhere because they act in a self-righteousness, thinking they are doing good for God, by preventing those people from serving elsewhere. That is malicious in every respect and also definitive of how a few people either in lay-ministry, or volunteer leadership can become cancerous and affect the attitude and behavior of others, which shouldn’t exist and unless it’s dealt with, it will continue on, to the death of the church. The reality is that Jesus says that because of this there will come a judgment upon those self-righteous people and the church. Remember, the Pharisees were religious leaders who were legalistic in their ways. Preferring themselves above others while looking down on others because they are not like them. What they believe and do affects others into believing and acting like them, creating a group of people who thought and did things that were right in their own eyes, but not in God's. In all of this, Jesus' words in verse 38 is most convicting to the church and those who are within the church and act like hypocrites. Read these words carefully from Jesus, he said, "See, your house is left to you desolate." This is the same as being one who is a hearer of the Word and not a doer of it (James 1:22). Don’t be fooled by hypocrites in the church, who claim to live in selflessness toward others, who put on a false display of religious devotion and do nothing to help others at all because how can any person claim to love God, if they aren’t willing to love others? They shut the kingdom of heaven in people's faces and imagine how rude that looks and sounds.